As I mentioned in my last post with the photo recap on my Flying Pig half marathon, it was a totally awesome experience. 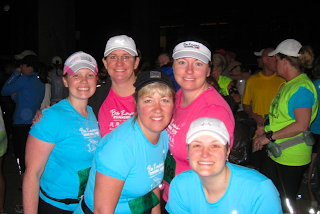 I trained for 4 straight months with the Running Spot training group for the half marathon. Twice a week, on Tuesdays and Saturdays, I would lace up my shoes and follow the running routes that were planned out by our coaches. All of the gals in the picture below have become some great friends of mine and I'm really thankful my path in life introduced me to them through this experience. 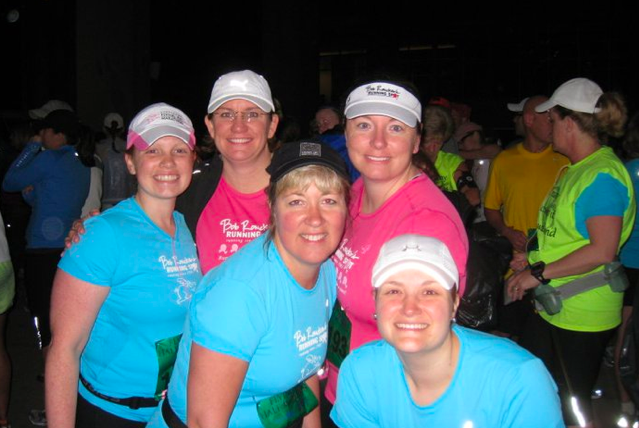 From left to right below is Julie, Amy, Coach Carolyn, Beth and myself gathered together right before we lined up for the start of the race: We all stayed together for the first mile or so and it was quite a rush to be among the thousands of runners all lined up in downtown Cincinnati. In the sea of all those people, I got separated from my group of girls, but ended up hooking up with another training group member named Adam. He and I ran together for miles 2-6 and that was great. Having someone new to talk with along the race was a really great way to get those first few miles under my belt without freaking out too much about those miles that were still to come. At mile 6.5 the course headed into a beautiful park in Cincy called Eden Park and that was were the relay switch occurred. So, I follow the path to switch out with JJ so he could start his portion of the 4-person relay run and then I continued on the half marathon course. Being able to share about 1/2 mile running with him was a really cool part of the day. Having him support me in so many ways and seeing him along this journey really helped me push on through the middle miles along the route. After JJ and I split off on different routes, I did have a bit of mental stuff start to happen. From about mile 7 on, I ran by myself along the route, which was not something I planned on doing. From my first training run, I had my running buddies right there beside me. But on this day, we all got separated and so there I was for 6.2 more miles alone with my thoughts. By Mile 10, I had pushed through some of the rough physical moments with my body, but there were some mental thoughts that started to creep in like "oh lord, I still have 3.2 mile to go", but like I had done on several training runs I dug deep and put my thoughts to good use. Remembering that I could in fact finish this and that I had made it to mile 10 already and the rest of the course was mostly down hill, so just keep putting one foot in front of the other to get to the finish line. These pictures of me below are around mile 11 & 12, so I'm almost about to hit the final straight stretch of the course towards the finish line. One of the Running Spot coaches spotted me with about .2 miles to go and I did my best to hold together the emotions I was feeling. I gave him a huge "high 5" and smiled from ear to ear - I had done it! With Coach Micheal's encouragement, he told me to pick out someone in front of me and beat that person across the finish line - so that's what I did - set my eyes on a gal in a gray t-shirt and pounded my legs so hard that I blew past her as I crossed the finish line. 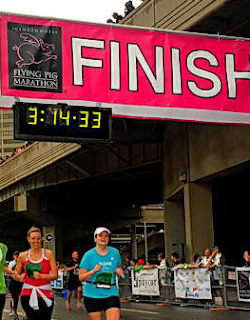 I had a totally awesome experience with my first (and maybe only) half marathon this past Sunday when I was one of about 20,000 people participating in Cincinnati's Flying Pig Marathon. 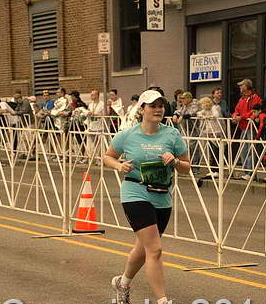 Here's a quick re-cap through some photos I took along the 13.1 mile course. 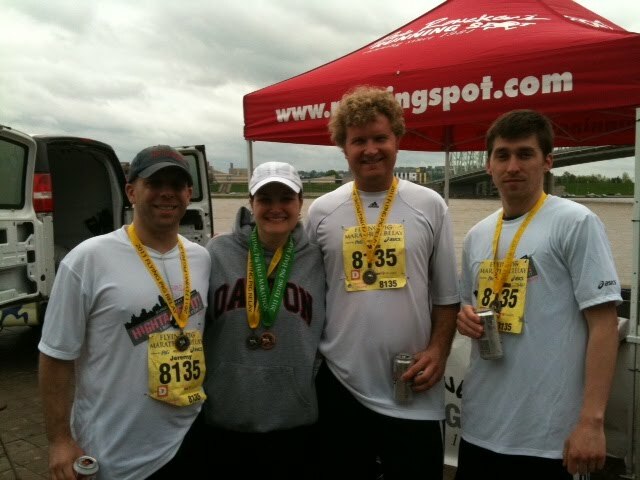 After party at the Running Spot tent with our 4 person Relay Team - Team Swine Flew! Once life settles down a little I plan on posting about how everything went and some more indepth details about the day. Like I said, it was really great - eventhough it rained the first 5 miles or so, I really embraced the morning and took in all the excitement and emotions that came along with completing this goal I'd set out to finish. I can not thank everyone enough for all the support these last few months and especially the days leading up to the big run. I received tons of shout outs on Facebook and also got many text messages from loved ones cheering me on and all of those mean so much to me. Looking forward to recaping things and getting another blog post up soon with the details and hopefully some of the office race day photos!